Originally Craig had said he wanted to do a homestay on the Mekong but we didn’t have enough time in HCMC to fit it in which was a shame. We were determined they wouldn’t miss out though so a day trip was the only other option. 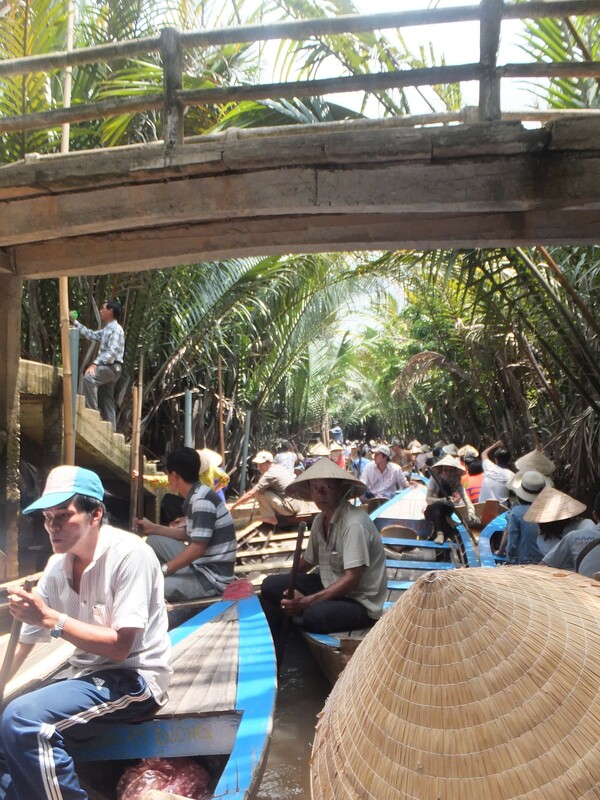 There are plenty of different tour groups that will take you to the Mekong Delta and they are a well oiled machines. The groups cover off the different districts of HCMC for hotel pick ups ensuring that the buses are on the road and heading to Mekong within the time frames specified. Traffic is mayhem in HCMC and this ensures that the tours run on schedule. We only had a short stay in Vietnam but if you are able to stay longer I found this brilliant post detailed how to spend 3 weeks in Vietnam and I honestly believe that the longer you have the better and there is plenty of things to do to fill in 3 weeks, a Mekong Delta Homestay would be my first recommendation! 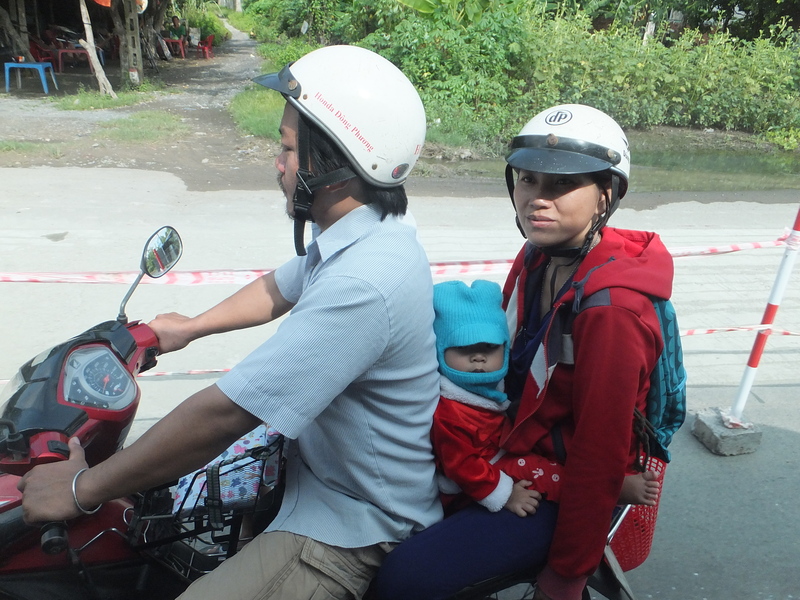 Once the kids are all grown up and off our hands, I would love to ride a motorbike across Vietnam from the South to the North of the country. 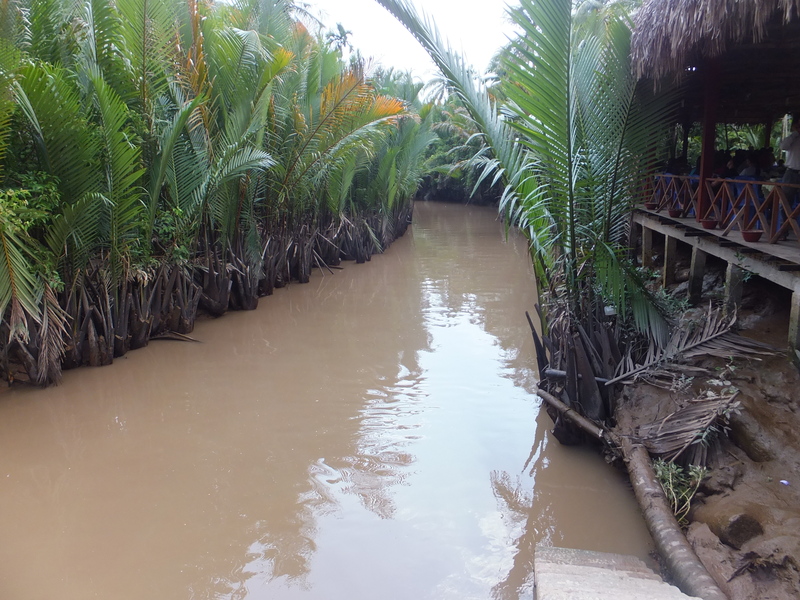 To book your own experience I highly recommend using Klook Mekong Delta Day Tour, you’ll secure a competitive price and it will ensure you get the date that you are looking for. This is particularly important if you are travelling in peak season. Look gives you the opportunity to pre-book prior to arrival in HCMC. When booking the tour we were advised to be in the foyer of our hotel, the Signature Saigon Hotel, at 8am for an 8am-8.15am pick up. We were the last to be picked up and then we were on the road heading off to the Mekong Delta. The drive is approx. 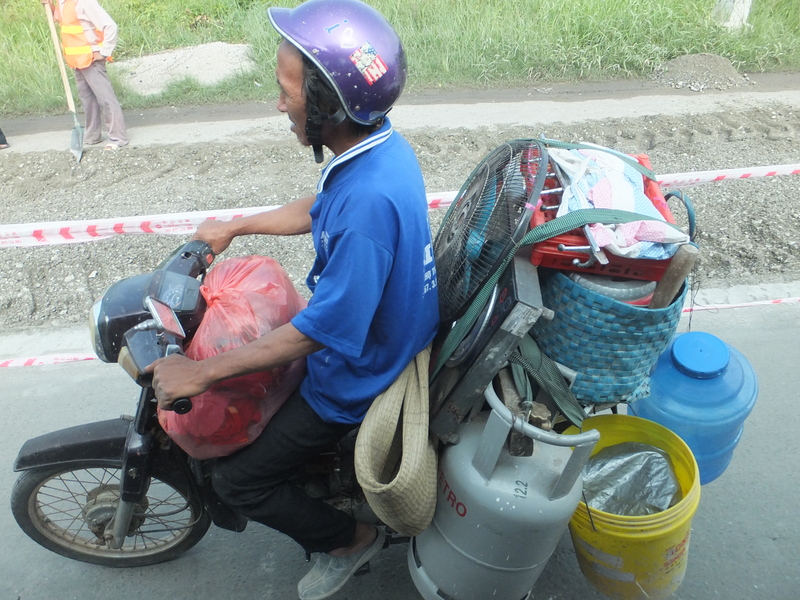 2 hours from HCMC and often longer depending on traffic. My favourite thing about sitting on buses is taking in life on the road. I could sit for hours taking it in and I think I took close to 300 photos, heres a couple of my best ones that tell you what life on the road in Vietnam is all about. Kids on bikes, no worries mate! 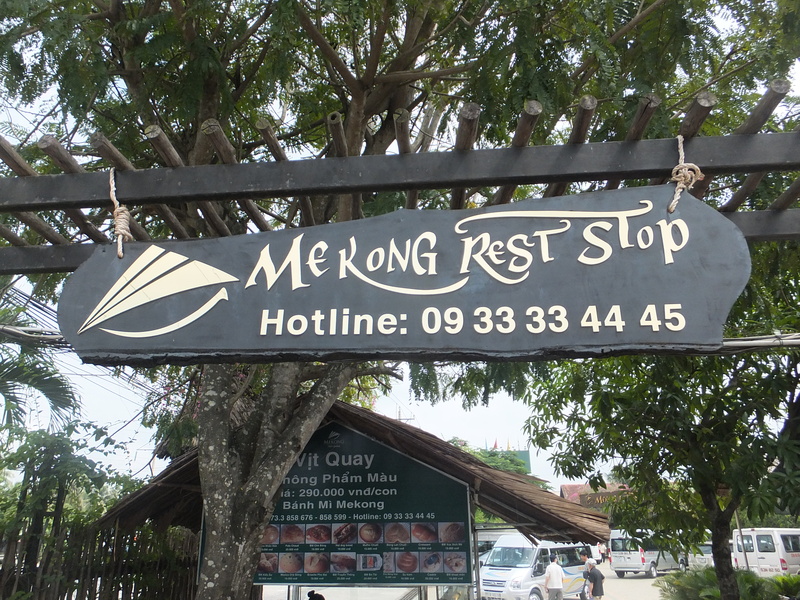 Phillip, our tour guide, told us that we would have a stop after about an hour or so into the trip at the Mekong Rest Stop, we stopped for around 20mins, enough time to go to the bathroom and do a spot of shopping or purchase some refreshments. It looked like most of the tours stopped here so the facilities were pretty clean and souvenir shop stocked most of what you see around the rest of Vietnam at the minute. I bought a few hand made book marks for gifts and Alannah wanted a bag that was the perfect size for her iPad mini. Back on the bus and off we went for about another hour until the bus arrived at a pier at Trung Luang on the Mekong. 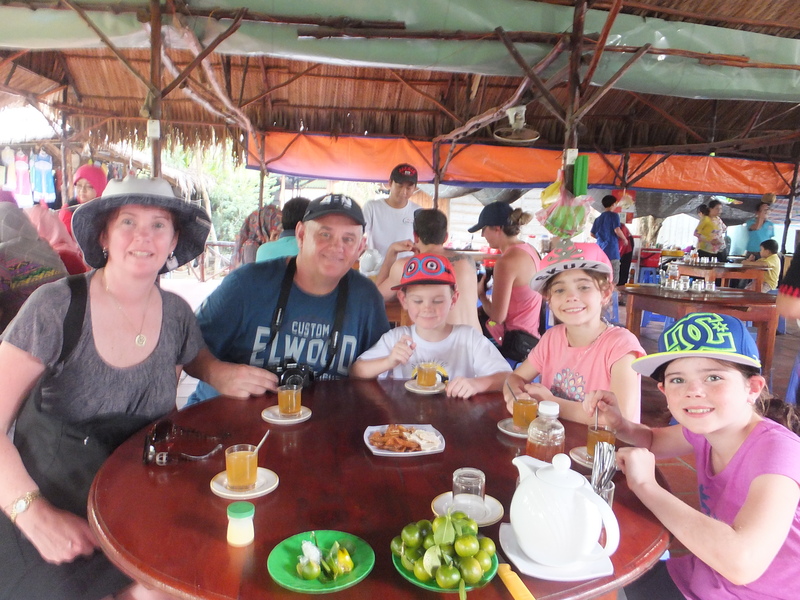 We left the bus there for the day and jumped on a motorised boat that took us across to My Tho where we tried some locally produced honey tea. 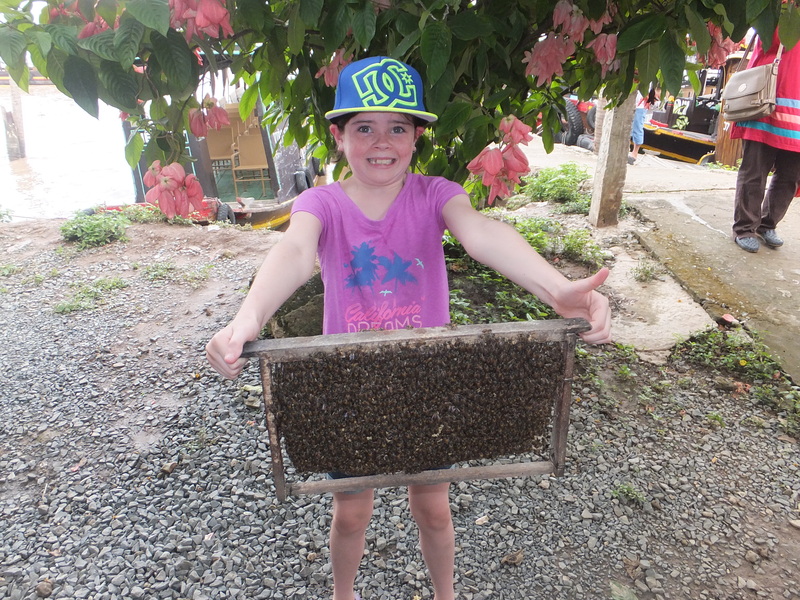 The honey is farmed by the local people and after tasting the tea you have the opportunity to purchase some to take home . The lady that served us had a little boy and he was really sweet, I took a photo of him with Caelan. Our larger boat to cross the Mekong. Our brave girl, I was surprised she had a go! Enjoying our honey tea produced locally. 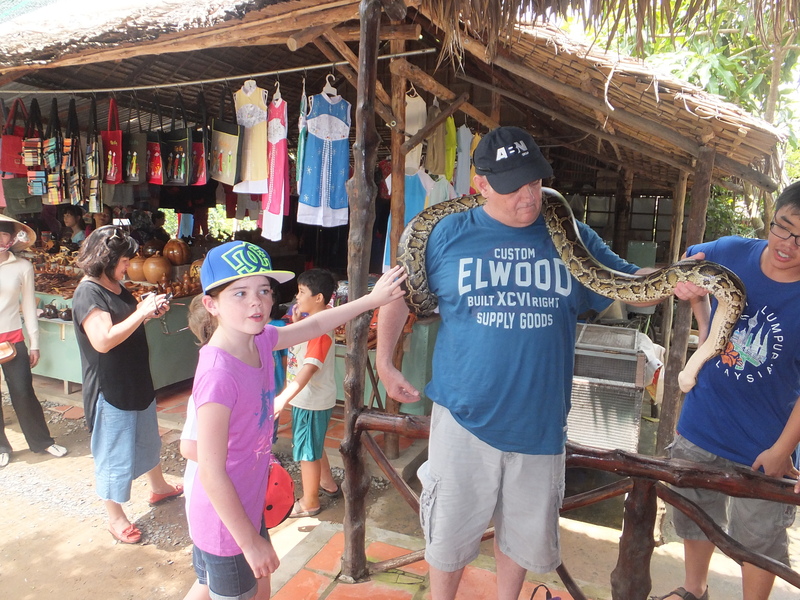 Dad was brave, until it turned its head! We then walked through the village and stopped for a fruit basket and listened to some traditional folk songs sung to us by the locals. We sat and listened to 3 singers while we enjoyed our fruit and then walked through to the rear of the village and got into a canoe. A couple of locals paddled us down the canal for 2kms where we got into larger boat which took us to another area that makes coconut candy. If you are going on this tour make sure you have some money to tip people along the way. It doest have to be a lot but a token of appreciation goes a long way and the local village people are very grateful. Busy day on the canal! 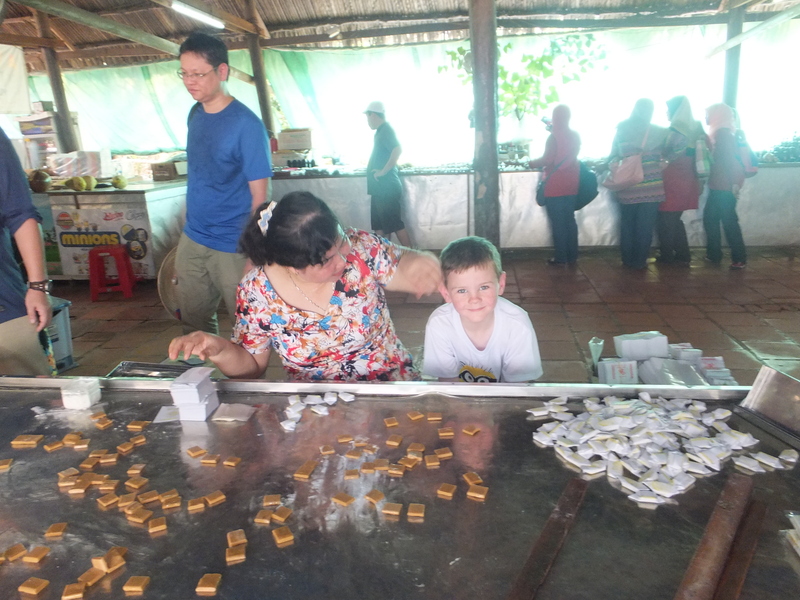 The coconut candy mill is also located on the banks of the Mekong. 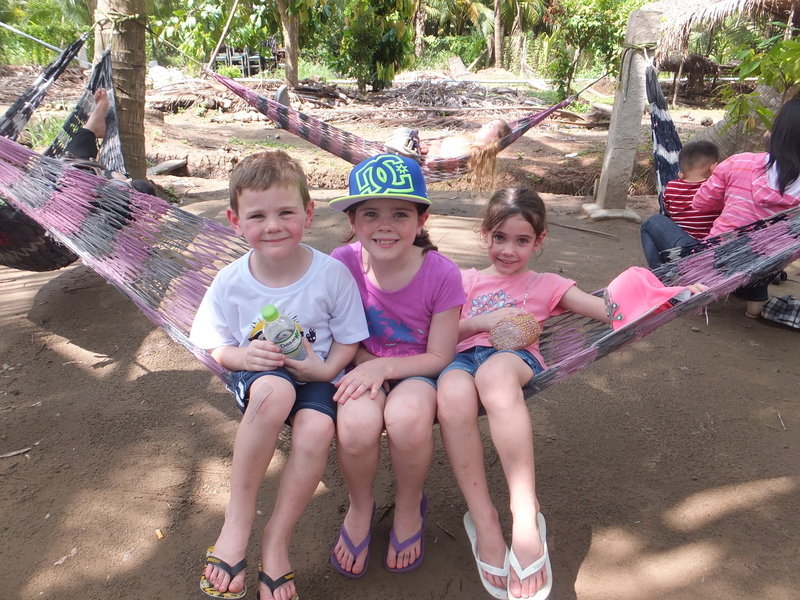 The coconuts are grown locally and the candy produced and wrapped ready for sale. I hadn’t realised Caelan had sat himself down next to the lady that was wrapping the candies, she was showing him how to wrap them and was letting him have a go. It was lovely watching him interact with her and she was very patient with him. The girls joined in on the action although I think once we left the candies might have had to been re-wrapped! You are also able to purchase some of the coconut candies which are now sitting on my kitchen table for visitors to taste. 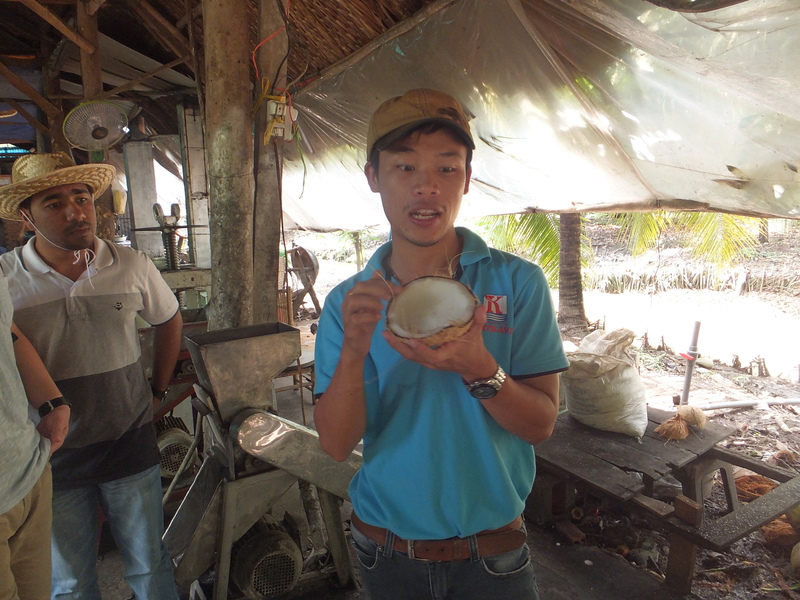 Phil our great tour guide explaining how to make coconut candy. 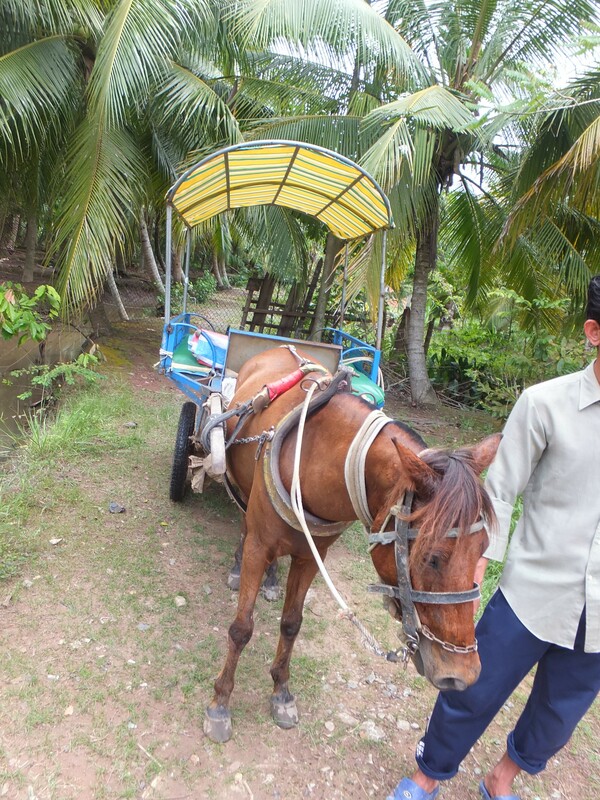 Next on the list was a horse and cart ride through the village to where the lunch restaurant was located. 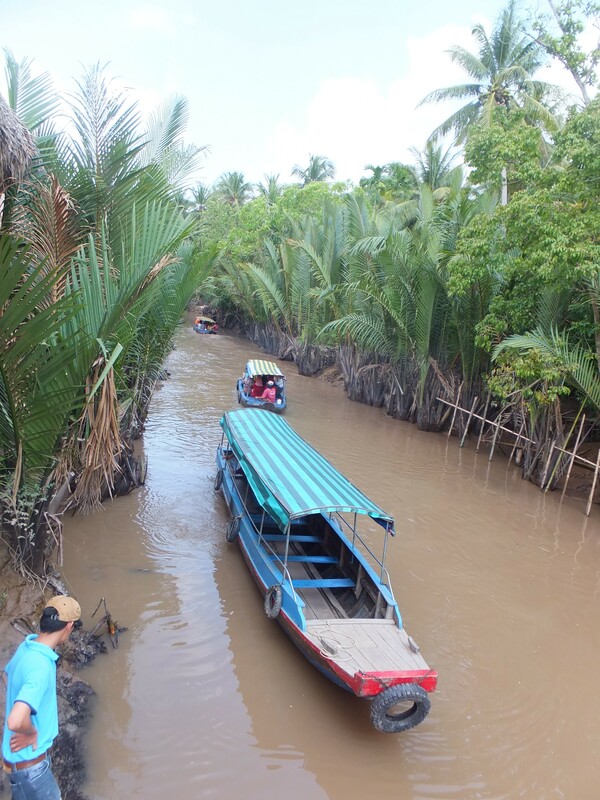 The ride took us through the back of the village, it was lovely to see how life on the Mekong operates. Its just like any other village, with vegetable gardens, brick double story houses, boat building workshops, people on motorbikes going about their lives and children playing everywhere. We had a short walk down to the restaurant where we were having lunch. Our horse and cart to take us to lunch! The restaurant was busy, it seemed that the majority of tour groups also go through this restaurant. 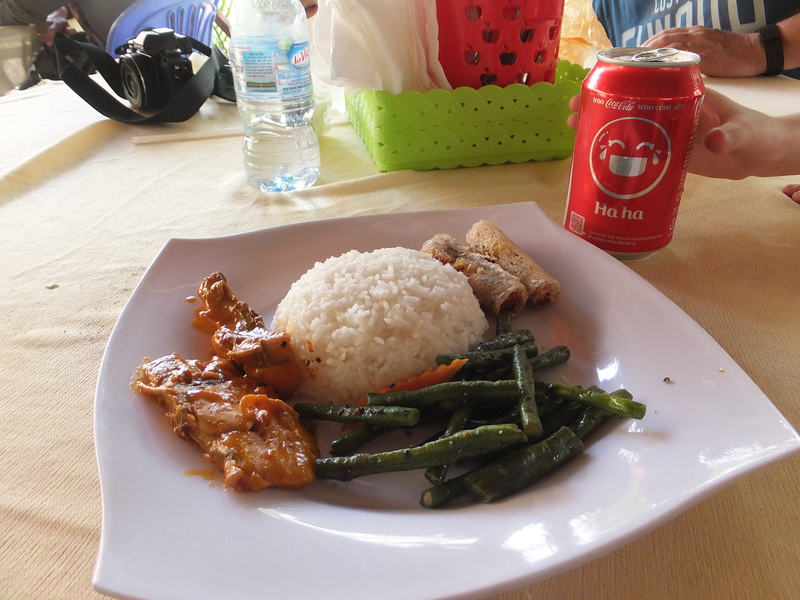 The food was fresh, traditional and tasty. You could choose to have the local speciality of elephant fish which is found in the Mekong. Craig had it last time and we knew the kids wouldn’t eat it so we stuck to the main standard dish of chicken, rice and pork spring rolls. The restaurant had bikes that you could use free of charge but unfortunately (or fortunately as it was hot and humid) they didn’t have kids bikes. Our local lunch, it was very nice! Having a little relax in the hammock! After eating we didn’t really have all that much time left, we had a look around the grounds and the pools with fish and crocodiles in them. 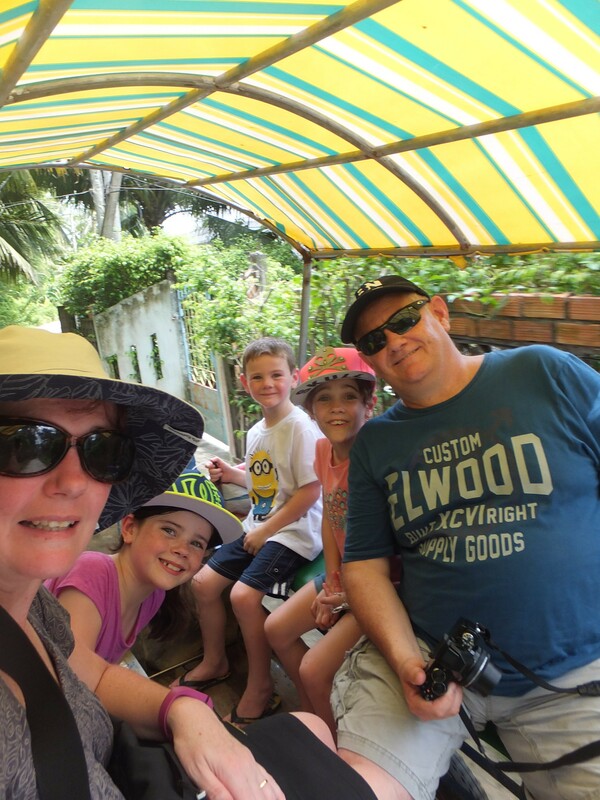 The kids enjoyed looking at the crocs and then we went to the bathroom and headed to the pier. We then had a motorised long boat ferry us down the canal back to the larger boat to take us back across the river to the bus. Last canal ride before heading back to the main boat to cross the river. Our long boats, used everywhere through the canals to get people around. The trip back to HCMC went quickly as they now have a freeway from the Mekong to HCMC, this cuts a lot of time from the trip as motorbikes are not allowed to travel on this road. The scenery is beautiful and you pass a lot of rice paddies and people going about their lives in the rural areas. 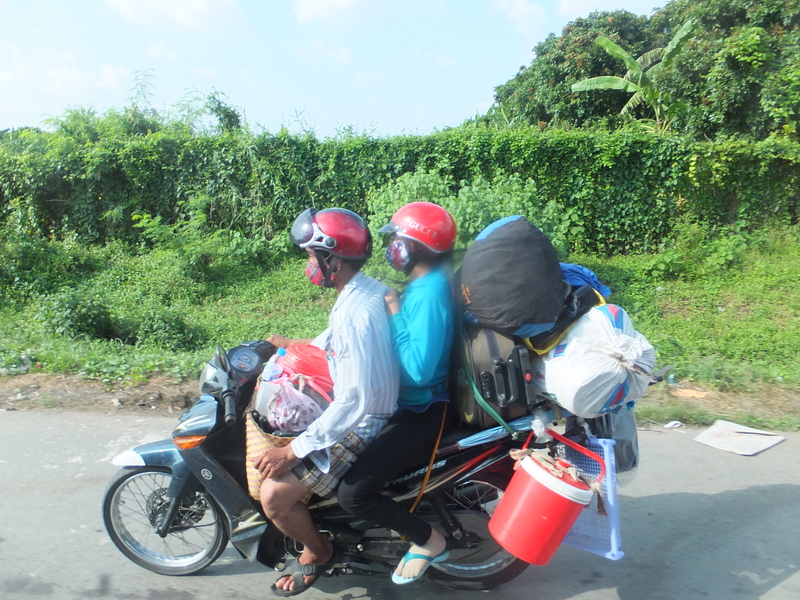 Life on the road – Vietnam! The kids really enjoyed this tour. I think the main reason they enjoyed it was that the tour was busy and there was plenty for them to do and see and involved a lot of interaction with locals. They didn’t have enough time to get bored as the tour sets a cracking pace! They got a bit unsettled on the bus but that was because they aren’t that interested in looking out the window. On the Mekong there were also plenty of local kids around with was great as they got to interact with them and see how lucky they are to live the way we do here in Australia. This is so interesting, I booked this exact same tour for yesterday, only through a different company. I really wasn’t impressed with it. I felt like it was more of a shopping trip than a tour. It looks like you were able to be more interactive, but I felt like my guide rushed through things and only brought us from “product to product”. 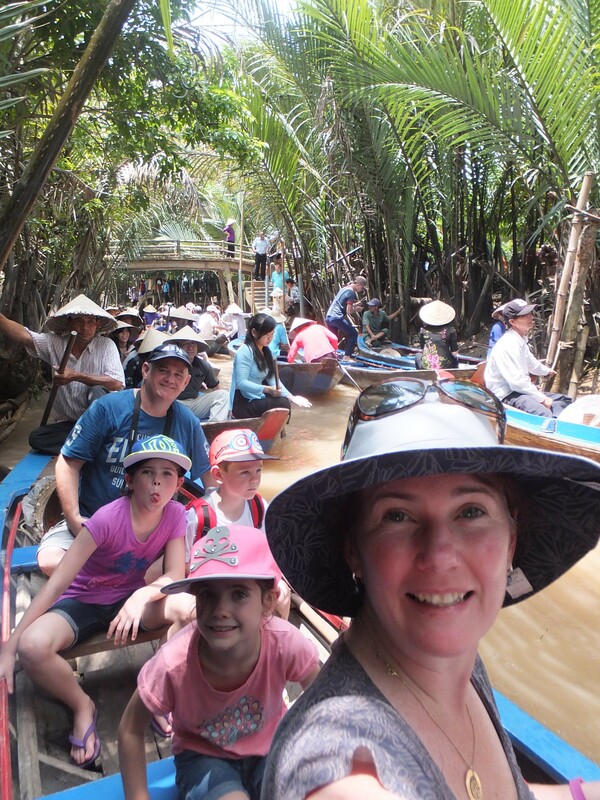 I found myself wishing I had either done a 2-3 day Mekong tour, or just skipped it altogether. Although, must say the coconut candy was delicious! I can understand how you feel like that, it was a bit rushed but for the kids the pace was great, kids like things moving and different so it kept their interest. We didn’t buy much although we did bring some yummy candies home for the family to try. 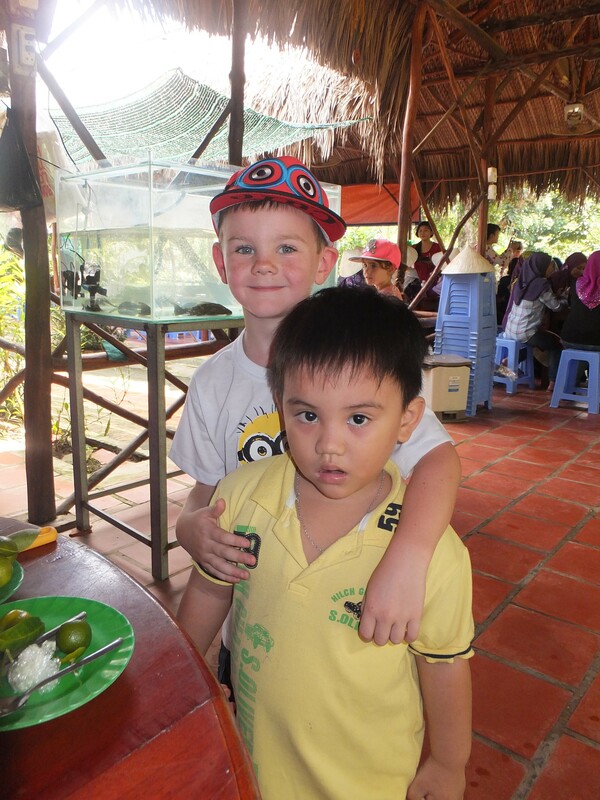 Craig and I did a homestay last time we were in Vietnam, that was 12 years ago. We really enjoyed it and had hoped to do it again this time with the kids. Unfortunately we didn’t have enough time which was a bit of a shame. I think there are too many operators moving in this space now as it seems a bit congested especially around the canal. It certainly wasn’t that busy 12 yrs ago. Unfortunately its becoming a bit of a sausage factory- churning them in and straight out again!